This article is about the 16th-century explorer. For the ocean strait between Vancouver Island, BC, Canada and Washington, USA, see Strait of Juan de Fuca. For other uses, see Juan de Fuca (disambiguation). Ioannis Phokas (Greek: Ἰωάννης Φωκᾶς), better known by the Spanish translation of his name, Juan de Fuca (born 1536 on the Ionian island of Cefalonia; died there 1602), was a Greek maritime pilot in the service of the King of Spain, Philip II. He is best known for his claim to have explored the Strait of Anián, now known as the Strait of Juan de Fuca, between Vancouver Island (now part of British Columbia, Canada) and the Olympic Peninsula (northwestern Washington state, United States). Phokás's grandfather, Emmanouíl Phokás (Ἐμμανουὴλ Φωκᾶς), fled Constantinople at its fall in 1453, accompanied by his brother Andrónikos (Ἀνδρόνικος). The two settled first in the Peloponnese, where Andrónikos remained, but in 1470 Emmanouel moved to the island of Cefalonia. Iákovos (Ἰάκωβος), Ioánnis's father, established himself in the village of Valerianos (Βαλεριάνος) on the island and came to be known as "the Valeriáno Fokás" (Gr: Φωκᾶς ὁ Βαλεριάνος) to distinguish him from his brothers. The name of the man known to history as Juan de Fuca is the source of some confusion. While Juan de Fuca is clearly a Spanish rendering of Ioánnis Phokás (Ἰωάννης Φωκᾶς), some sources[which?] cite Apóstolos Valeriános (Ἀπόστολος Βαλεριάνος) as his "real" name. It is possible that Phokás was baptized Apóstolos and later adopted the name Ioánnis/Juan (i.e., John) because Apóstol is not much used as a name in Spanish. Given that Fokás/Fuca was the family name borne by the seafarer's father and grandfather, Valeriános is likely to be a nickname used on the island which would have been quite meaningless in the Spanish Empire. De Fuca's early voyages were to the Far East, and he claimed to have arrived in New Spain in 1587 when, off Cabo San Lucas in Baja California, the English privateer Thomas Cavendish seized his galleon Santa Ana and deposited him ashore. He was a well-traveled seaman, perfecting his skill as a pilot in the Spanish fleet. The King of Spain, he also claimed, recognized him for his excellence and made him pilot of the Spanish navy in the West Indies (a title he held for forty years), but there is no record in Spanish Archives of his name or position or of his visit to the royal court. Before he made his famous trip up the northwest coast of the North American continent, he sailed to China, the Philippines and Mexico. The Strait of Juan de Fuca between the United States of America and Canada was named for him by British Captain Charles Barkley because it was at the same latitude that Juan de Fuca described as the location of the Strait of Anián. Fuca Pillar at Cape Flattery, Washington beside the Strait of Juan de Fuca. In 1592, on his second voyage, de Fuca enjoyed success. Having sailed north with a caravel and a pinnace and a few armed marines, he returned to Acapulco and claimed to have found the strait, with a large island at its mouth, at around 47° north latitude. The Strait of Juan de Fuca is in fact at around 48° N, although Fuca's account of sailing into it departs from reality, describing a region far different from what actually existed there. 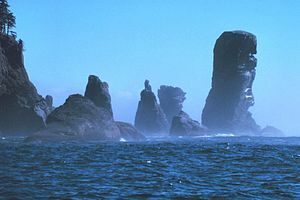 During the voyage, de Fuca also noted a "high pinnacle or spired rock", which may have been Fuca Pillar, a tall, almost rectangular, rock on the western shore of Cape Flattery on the northwestern tip of Washington beside the Strait of Juan de Fuca - although de Fuca noted it being on the other side of the strait. Despite Velasco's repeated promises, however, de Fuca never received the great rewards he claimed as his due. After two years, and on the viceroy's urging, de Fuca travelled to Spain to make his case to the court in person. Disappointed again and disgusted with the Spanish, the aging Greek determined to retire to his home in Kefallonia but was in 1596 convinced by an Englishman, Michael Lok (also spelled as Locke in English and French documents from the period), to offer his services to Spain's archenemy, Queen Elizabeth. Nothing came of Lok and de Fuca's proposals, but it is through Lok's account that the story of Juan de Fuca entered English letters. Because the only written evidence for Fokás's voyages lay in Lok's account — researchers being unable to find records of the expedition in Spanish colonial archives — there was long much controversy over his discovery and, indeed, whether he had ever even existed as a real person; several scholars have dismissed Juan de Fuca as entirely fictitious, and the 18th-century British explorer Captain Cook strongly doubted that the strait Fokás claimed to have discovered even existed (although Cook actually sailed past the Strait of Juan de Fuca without entering it and did stop at Nootka Sound on the west coast of Vancouver Island). With later English exploration and settlement of the area, however, Fokás's claims seemed much more credible. Finally, in 1859, an American researcher, with the help of the U.S. Consul in the Ionian Islands, was able to demonstrate not only that Fokás had lived but also that his family and history were well known on the islands. While we may never know the exact truths that lay behind the account published by Lok, it must be considered unlikely that the man himself was fictional. The Juan de Fuca Ridge and the Juan de Fuca Plate, a tectonic plate underlying much of the coastline he explored, is named for the Strait of Juan de Fuca. ^ Dunbabin, Thomas (1979) . "Fuca, Juan de". In Brown, George Williams (ed.). Dictionary of Canadian Biography. I (1000–1700) (online ed.). University of Toronto Press. ^ Fokás in 1596 claimed to have been some forty years in the king of Spain's service. ^ a b Williams, Glyndwr (2003). Voyages of delusion: the quest for the Northwest Passage. New Haven: Yale University Press. ^ Gough, Barry M. (1987). "Barkley, Charles William". In Halpenny, Francess G (ed.). Dictionary of Canadian Biography. VI (1821–1835) (online ed.). University of Toronto Press. "Ioannis Apostolos Focas Valerianos (Juan de Fuca). The Kefallonian adventurer of the 16th c.", by Evridiki Livada Duca, Kefallonia 2001, published by the Municipality of Elios - Pronnoi.